"There are great for a change of latke pace! Terrific for Hanukah parties when you're looking to give your friends a little extra." Place the zucchini, potato and carrots in a colander, place paper towels or a cheesecloth over the top and squeeze out as much moisture as possible. Sprinkle salt over the vegetables and let them drain for 15 minutes. Squeeze vegetable again in paper towels. In a large mixing bowl combine eggs, vegetables, salt and pepper. Mix well. Stir in matzo meal or flour, parsley and feta. Heat vegetable oil in a large frying pan. 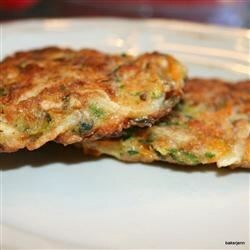 Place vegetable mixture, formed into pancake sized cakes in hot oil and fry until golden brown on both sides. (Cook two to three minutes per side). Add more oil as needed to keep cakes frying up well. Drain fried latkes on paper towels. Didn't like the flavor of the Latkes; way too much garlic for the sauce. Actually used this batter in a waffle iron. Delicious.